Read about Pain in Lower Left Abdomen Symptoms, Causes, Treatments. Left lower quadrant pain is the name commonly used to describe pain in your lower left part of the abdomen. Lower left abdominal pain is usually linked to the digestive tract. However, the condition can also be related to complications of the skin, reproductive organs, urinary tract, body wall or the blood vessels. The condition causes tenderness and a severe pain that may cause rigidity in the abdomen region. Constipation could seem as a continuous constraining pain, usually in the LLQ. It is usually caused by food with low-fiber content like cakes, meat, etc., insufficient water, dry food, skipping meals and bodily pain. Such conditions will most likely lead to sharp pain in lower left abdomen. An infection of the urinary tract is usually linked to pain during urination or a continuous urge to urinate. The infections are normally microbial infections affecting the excretory system that comprises of the kidneys, bladder and ureter or urethra. A bacterial infection on the bladder leads to a condition known as cystitis that can also lead to lower left abdominal pain, a burning sensation during urination or a recurrent urge to urinate and pelvis discomfort. Crohn’s disease and ulcerative colitis are common causes of left abdominal pain. For the Crohn’s disease, abdominal pain is usually one of the first symptoms useful in diagnosing the condition. These inflammatory bowel conditions cause acute pain in the abdomen, severe diarrhea, vomiting and rectal bleeding among other complications. Lower abdominal pain is also a symptom of irritable bowelsyndrome that is usually characterized by an unusual gut contraction. Other symptoms of this bowel related condition are irregular bowel movements, passing stools with mucus, abdominal cramping and flatulence. A disorder of the kidneys (kidney stones) is normally caused by high amounts of calcium or uric acid in the body. Dehydration can also be a cause of kidney stones. A common symptom is having a lower left abdominal pain, fever, nausea, groin pain and vomiting. Lower left abdominal pain can also be caused by an infection of the kidneys. It usually begins with the bladder and then reaches out to the kidneys. The acute pain can also be felt alongside continuous urination, burning sensations while urinating and hematuria among other symptoms. The ectopic pregnancy condition in women can lead to a pain in the lower left part of the abdomen. Other causes can be ligament pain emanating from luteal cysts and the expanding uterus among others. Endometriosis, which involves the growth of the uterus tissue lining outside the uterine cavity leads to pain, irritation, and the growth of adhesions. It may also lead to constipation, diarrhea and pain while urinating and during menstruation. Ovulation pain or mittelschmerz involving the left ovary occurs when an egg is released two weeks before an expected period. This may cause a mild to moderate discomfort in the left lower abdominal area and may be experienced either as a sharp and sudden pain or as a dull, cramp-like pain. 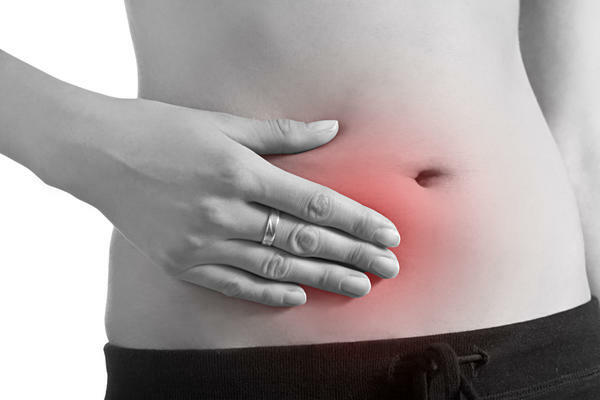 Symptoms of lower left abdominal pain may be experienced as an acute or chronic type of pain. Pain may be described as a dull aching pain or a sharp, stabbing or burning pain. The pain may be intermittent, spontaneous, or persistent. In addition, left lower abdominal pains may be accompanied by other symptoms including loss of appetite, nausea, vomiting, tenderness, fever, heaviness or fullness. Rest of the symptoms are disease specific. Lower left abdominal pain can be a result of acute medical conditions. Therefore, you need to look out for urgent medical attention. When you have no bowel movements or have blood in your vomit, a rigid abdomen, and blood in your stool, an abrupt start of an acute pain, vaginal bleeding and abdominal pain during pregnancy. A decreased appetite, bladder symptoms and a fever should also make you worry and go for medical checkup. The conditions leading to sharp pain in lower left abdomen are a result of poor eating habits. Therefore, it is highly advisable to take a balanced diet in your meals. Make sure you drink at least 8 glasses of water per day. This will avert tummy related issues like constipation and gas. More than a balanced diet, you need to watch over the kind of food you take in. Carefully note the foods that cause irritation to your abdomen and keep off them. Bodily exercises like waist dance and yoga are very helpful in making the abdominal muscles relax. This is an effective way of taking the abdominal pain away. Avoid putting a lot of pressure on the affected abdominal area by sleeping well. Get the help of a fitness instructor and learn more on how to sleep well in order to reduce the lower left abdominal pain.